We currently have teams that play Monday, Wednesday & Thursday evenings at the Club. Four teams play on Monday evening. They belong to the Southampton Clubs (Invitation) Darts League. One team plays in the Wednesday evening league. Thursday evenings it is the turn of the Ladies who play in the Southampton Pubs & Clubs Ladies Darts League. They all play in one Divisions. All of our teams are keen to include new Members, so why not come along to the Club and we will introduce you to the team which most suits you. 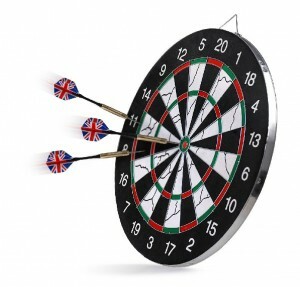 We also run a Competition called the Southampton Darts Series for about 40 weeks of the year on Thursday evenings. This is open to all Darts players, and has cash prizes both for the evening and the whole Series.